How to calculate volume of a cylinder? 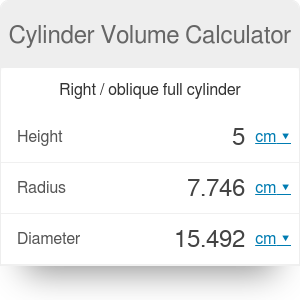 Our cylinder volume calculator enables calculating the volume of that solid. Whether you want to figure how much water fits in the can, coffee in your favorite mug, or even what's the volume of a drinking straw - you're in the right place. The other option is calculating the volume of a cylindrical shell (hollow cylinder). Enter the external radius of the cylinder. The standard is equal to approximately 5.5 cm. Determine the internal cylinder radius. It's the internal radius of the cardboard part, around 2 cm. Find out what's the height of the cylinder, for us it's 9 cm. Tadaaam! The volume of a hollow cylinder is equal to 742.2 cm3. Remember that the result is the volume of the paper and the cardboard. If you want to calculate how much plasticine you can put inside the cardboard roll, use the standard formula for the volume of a cylinder - the calculator will calculate it in the blink of an eye! The oblique cylinder is the one that 'leans over' - the sides are not perpendicular to the bases in contrast to a standard 'right cylinder'. How to calculate the volume of an oblique cylinder? The formula is the same as for the straight one. Just remember that the height must be perpendicular to the bases. Now when you know how to calculate a volume of a cylinder, maybe you want to determine the volumes of other 3D solids? Use this volume calculator! If you are curious how many teaspoons or cups fits into your container, use our volume converter. To calculate the volume of soil needed for flower pots of different shapes - also for the cylindrical one - use the potting soil calculator. Cylinder Volume Calculator can be embedded on your website to enrich the content you wrote and make it easier for your visitors to understand your message.